Easy Gluten-Free Dinner Rolls that will satisfy cravings for soft and tasty bread. The recipe also has a dairy-free option. In 2010 when I went gluten-free, I had a really hard time finding good gluten-free bread, especially roll and buns. That’s when I found Gluten-Free Mama’s Almond Flour Blend and her recipe for gluten-free homemade bread. I tried her recipe in my bread machine and finally had hope for good gluten-free bread! I modified that recipe for my family and staring making my Homemade Gluten-Free Bread instead of dinner rolls. This year I worked on making my homemade gluten-free bread recipe into dinner rolls. It took a few tries because, not only do I test bake for gluten-free, but I make a separate batch that is both gluten-free and dairy-free. 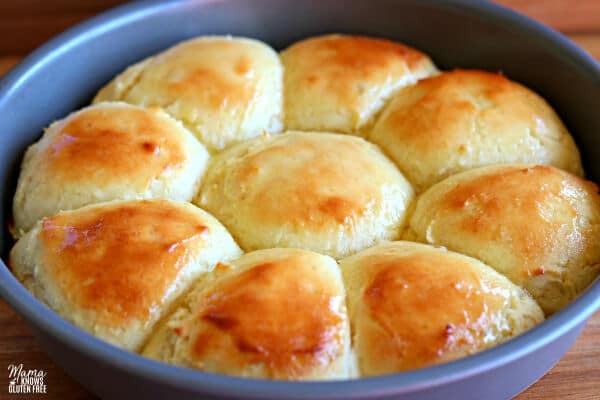 My family is very excited to have dinner rolls again, and I am so happy to share the recipe with you! In a large bowl, add the gluten-free all-purpose flour, salt, and xanthan gum (leave out if your flour already has it). Warm the milk to 110°F-115°F. I microwave the milk in a large glass measuring cup for 1:30. I also use a thermometer to check the temperature. If your milk is too hot, it will kill the yeast. Pour warm milk over the yeast. Spray two 9 inch cake/pie pans with gluten-free cooking spray. I like to use metal pans, but you can use a glass pan. Take a small spatula and smooth out the tops of the dough. 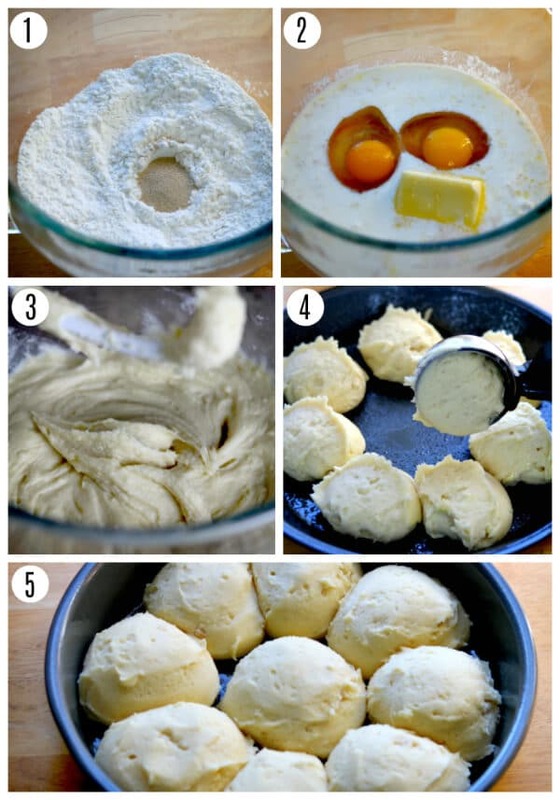 You should have 8 dough balls around each pan and 1 dough ball in the center. This recipe makes 18 rolls. Rolls are best when eaten warm. If you have any left-overs store in an air-tight container and reheat before eating. I have also included a dairy-free option for the recipe. My husband, myself and youngest son are all dairy-free as well. So, now you too can enjoy a gluten-free and dairy-free dinner rolls. I promise it is just as delicious made with the dairy-free butter and dairy-free milk. Some of my favorite dairy-free alternatives that I like to bake with are almond, cashew or coconut milk. I also like baking with coconut oil or Earth Balance or Smart Balance butter. These gluten-free dinner rolls are made with the instant quick-rise yeast, so there’s no having to proof your yeast. Using instant quick-rise yeast also cuts the dough’s rising time in half! More Gluten-Free Bread Recipes For You To Try! 3 cups all-purpose gluten-free flour I like Pillsbury gluten-free flour. Not all gluten-free flours are created equal. You may experience different baking results depending on the gluten-free flour blend you choose. In a large bowl add the gluten-free all-purpose flour, salt, and xanthan gum (leave out if your flour already has it). Add the yeast to the gluten-free flour mix by making a little hole with your finger in the flour and pour the yeast into the hole. Warm the milk to 110°F-115°F. I microwave the milk in a large glass measuring cup for 1:30. I also use a thermometer to check the temperature. If your milk is too hot it will kill the yeast. Pour warm milk over the yeast. Add the softened butter, eggs, apple cider vinegar, and honey to the bowl and mix until fully combined. (2-3 minutes) You may need to scrape the sides down to make sure all of the flour is mixed well with the ingredients. I like to use my dough attachment to my KitchenAid mixer, but you can use the paddle attachment. The dough will be sticky. Using an ice cream scoop place the dough balls into the pans. Spray your ice cream scoop with gluten-free cooking spray to help the dough not stick. Take a small spatula and smooth out the tops of the dough. 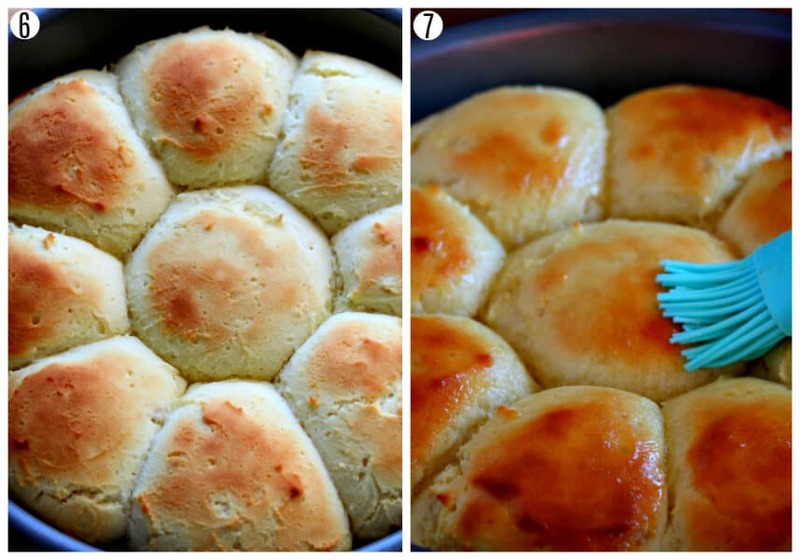 You should have 8 dough balls around each pan and 1 dough ball in the center. This recipe makes 18 rolls. Cover the pans with a kitchen towel and allow to rise in a warm place for 1 hour. Bake the rolls on the middle rack for 14-16 minutes. They will turn a nice golden light brown. Please watch your oven because all ovens are different. The temperature of the rolls, it should measure 200°F internally. 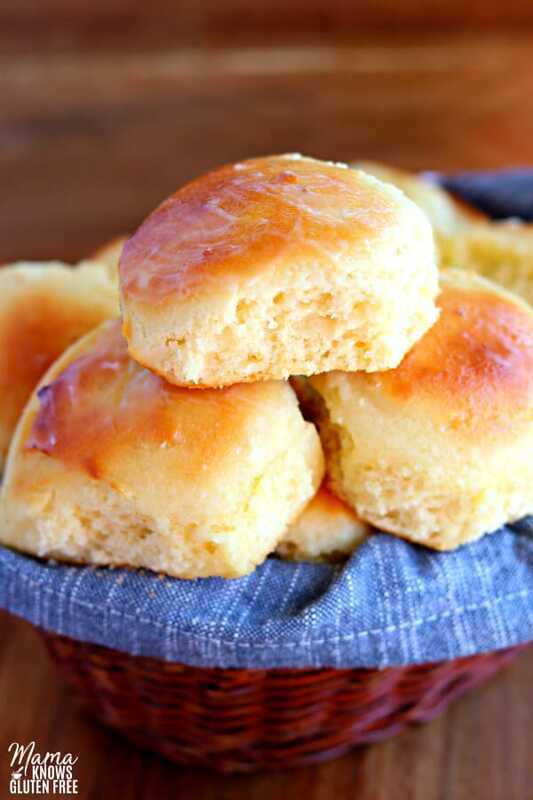 Melt 2 tablespoons of butter and brush the tops of the rolls before serving. Enjoy! The rolls are best when eaten warm. If you have any left-overs store in an air-tight container and reheat before eating. For the dairy-free option, I used almond milk and Smart Balance butter. Mama says, "Please check all of your labels!" Do you think this would work ok with an egg substitute (like a flax seed egg)? Thanks! Hi Carrie! I have not tested this recipe with an egg substitute. If you try it could you please let me know how it turned out? If you try it, I hope you enjoy the rolls. Thanks! Amazing recipe! Easy to follow recipe and tastes like traditional yummy holiday rolls! Thank you so much Helena for the wonderful 5-star recipe review! It makes my heart so happy to hear you enjoyed the rolls. My family loves them and I will be making them for the holidays also. Thanks again! What is the apple cider vinegar for. No where in the instructions does it say to use it, yet it is in the I gredient list. Hi Penny! The apple cider vinegar helps with the moisture and lift. You add it the same time that you add the eggs, honey, and butter. I apologize for the oversight and thank you for bringing it to my attention that it was missing from the instructions. I have updated the recipe. I hope you enjoy the dinner rolls. Have you tried making these ahead of time? How do they hold up? Hi Carrie! These rolls are best when baked fresh and served warm. They are amazing fresh baked out of the oven. Thank you for asking! I made these dinner rolls for our Christmas dinner. They turned out amazing! This was my first time ever baking homemade rolls of any kind. I used Better Batter flour for this recipe. Thanks for such a simple and delicious recipe to follow. You have helped me to build confidence in the kitchen. Thank you so much Kristen for the amazing 5-star recipe review! 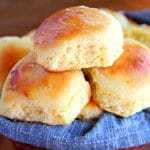 I am so happy that you enjoyed the dinner rolls and that you found the recipe easy to follow. I can’t wait to try Better Batter flour with this recipe when they start re-shipping their gluten-free flour in January. It makes my heart that I have helped you build your confidence in the kitchen! Your kind words really made my night. You are so welcome, I love sharing what I make for my family. Thank you again! These dinner rolls were a big hit at our Christmas dinner! Very easy recipe and great results. My husband commented that he thinks these rolls could be used to recreate Chick Fila chicken minis, which he desperately misses. Thanks for another great recipe! Thank you so much Val for the wonderful 5-star recipe review! I am so happy that you all enjoyed the dinner rolls and you found it to be an easy recipe. That’s a great idea to try to make gluten-free chicken minis. I’ll have to try that! My kids would love that. You are so welcome I love sharing what I make for my family. Thank you again. Loved your recipe! Made it for our Christmas meal and even the non-GF people thought they tasted awesome. I made it with the ingredients I have available in Spain and although I don’t think they rose as high as yours, they were yummy! I froze the rest of the recipe to pop in the toaster for breakfast or for a sandwich. 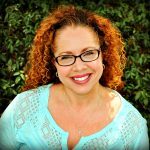 Thank you Joy for the wonderful 5-star recipe review! I am so happy that you all enjoyed the dinner rolls. It makes me really excited to hear that you were able to make them with the ingredients that you have available in Spain. That’s a great idea about freezing them. I have not tried that yet, because my family eats them all. I do make a double batch of my biscuits and freeze them for baking later. Thank you again! Hi! I have not made these yet, but making 18 rolls for just my husband and I is way too much. Can you give me a tip for freezing? Should I bake the rolls first then flash freeze the balance? And how would I warm up the frozen already baked ones? the uncooked frozen rolls? Just curious if it would affect the texture of the rolls. I’m new to your site and I’m loving your recipes. Can’t wait to try them. Hi Cynthia! I have never tried freezing them before. The dinner rolls are best when baked fresh. You could cut the recipe ingredients in half. I have frozen my gluten-free biscuit dough, but I have not tired to freeze the dinner rolls. I hope you enjoy the dinner rolls! Thank you so much Ellen for the amazing 5-star recipe review! My heart is so happy to hear that you and your family enjoyed the dinner rolls. This totally made my day! You are so welcome, I love sharing what I make for my family. Thank you again! much the same as your sliced loaf bread recipe…which by the way, is a great recipe. Hi Samantha! I have not tired make the rolls in my bread machine. I totally understand about avoid some of the clean-up. The dinner roll dough is just a little thicker than the bread dough. If you try it in your bread maker can you please let me know how it turns out? I am happy to hear that you enjoyed the bread recipe. I hope you enjoy the dinner rolls too. You are so welcome Samantha, I love sharing what I make for my family. Thank you so much for your encouraging words! Thank you so much for the amazing 5-star recipe review Brianna! I am so happy that you enjoyed the dinner rolls. You just made my night! Thank you so much. I have a been admiring the photos of these rolls since Thanksgiving time and have not had a chance to try them out. We bake cookies, muffin and cake every day but gf bread and rolls seem to be my nemasis lol, they never come out good!!! I finally made them yesterday and my family was thrilled. They were the best tasting rolls since going gluten free almost a year ago!! Great texture and flavor!! These gf rolls will be made weekly in our house! Thank you for sharing!! Thank you so much for the wonderful recipe review! I am so happy that you and your family enjoyed the dinner rolls and that you found them to have great flavor and texture. I totally understand about gluten-free bread being tricky. It took me a while to get these rolls just right. It really makes my heart happy to hear that you will be making these weekly in your house! You are so welcome, I love sharing what I make for my family. Thank you again! I adjusted this Recipe by one-half, as I wanted a small quantity. Also, I used a bread roux. Rolls were fluffy and moist. I made recipe several times. I wasn’t satisfied with results until I adjusted recipe to include bread roux, substituted buttermilk for milk, and 1/3 cup of sugar. With my adjustments, these rolls taste better than my gluten dinner rolls and were more moist. Thank you so much Cheyenne for the wonderful 5-star recipe review. I am so happy that you enjoyed the dinner rolls and were able to modify the recipe to your liking. I have never tried a bread roux before, I need to look into that. Thanks for the tip. I do like baking with buttermilk. Thank you again! Just made these two days ago and they were THE best rolls I have made that are gluten free. I would really recommend using the 200 degree internal temp for “doneness.” It was perfect. I made a batch into bread and that worked out as well (I haven’t had a gf bread worth eating – so I could have cried when this one fit the bill). My husband (who isn’t gf) asked me to make the dough and turn it into cinnamon buns – so I am in the process of raising the buns right now. They look delicious. I will note that I make my own GF flour and have been fiddling with it for the past year – I think I finally have the perfect combination! Couple my flour with your recipe and fireworks! Thank you so much Colleen for the amazing 5-star recipe review! It makes my heart so that you and your husband enjoyed the rolls. I am happy to hear that you were also able to use the recipe to bake bread. I love cinnamon buns! Please let me know how they turn out. That’s awesome that you have created your own flour mix. I have not tried that yet. I would love to know what you are using in your flour blend. Thank you again! The cinnamon buns were wonderful. I rolled the wet dough out on a oiled parchment paper and oiled the top and then rolled the dough. Then I made them just like regular cinnamon buns. I will say that if you are looking for a syrupy bun – you should add more brown sugar/honey than normal (or whatever you normally use – use more of it). The gf grains soak up the moisture more than wheat. I find that I have to let the dough raise 3-5 hours before it gets to the height I want and that is fine. Could be this cold weather we are having slowing down the yeast development. I put a cream cheese frosting on top and everyone loved them. This flour does not have the gritty texture of others. I notice if I use Bob’s Mill stone ground flours it always comes out grittier than I like. I have been buying all of the flours in my recipe at Vitacost – their own brand grains – great price, most are organic, non-gmo, and I don’t have the gritty factor at all. I mix it myself. This recipe is the closest I have come to the wheat flavor I craved and the texture is the closest as well. I add quinoa and amaranth occasionally – when I want a stronger flavored/denser flour (only a 1/4 cup each). If you (or one of your readers) uses my flour recipe – let me know what you think. I would love to hear your thoughts. Thank you so much Colleen for sharing your flour blend! I really need to try it. I also need to check out Vitacost. I am so happy to hear that the rolls made great cinnamon buns too. Thank you again! This looks amazing! Trying these for my sister in law that needs GF and dairy free. Quick question, the almond milk, etc. That is unsweetened? Thank you! Hi Jamie, thank you so much! Yes, I use unsweetened almond or cashew milk when I make these rolls dairy-free. I hope that your sister in law enjoys them! Thank you Audrey! Tried 1/2 the recipe using my homemade gluten free flour mix. Made 6 burger sized buns. They were sooo good. Almost like regular brioche buns. I’m going to try the next batch as hot cross buns for Good Friday. Thanks again Audrey, Happy Easter! Thank you so much Hazel for the wonderful 5-star recipe review! I am so happy that you enjoyed the rolls. I am glad to hear that the recipe worked with your homemade gluten-free flour mix. I’ve made buns with this recipe too and they always turn out yummy. I need to make hot cross buns too, such a great idea. Wishing you a blessed Easter. Thanks again! 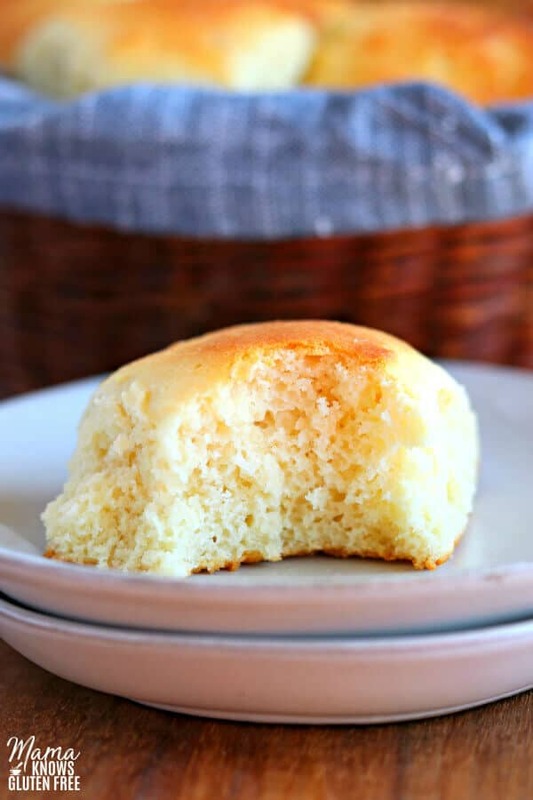 Thank you for this great gluten free, dairy free rolls recipe. I’d like to try the rolls for Easter. Could I substitute unsweetened soy milk in place of almond milk? We are also avoiding nuts. Hi Carol! Soy milk sound work in this recipe. I have not tried the recipe with soy milk, because I am sensitive to soy. I hope you enjoy the rolls! You are so welcome, I love sharing what I make for my family.